Due to quick sellouts in Cleveland and Boston, Dropkick Murphys have announced additional shows for their 20 Year Anniversary Tour. The band will kick off the tour a day early with a February 17 show at Cleveland’s House Of Blues. Dropkick Murphys have also announced four more Boston hometown shows for St. Patrick’s Day Week in addition to the previously announced March 19 Agganis Arena show, which is now sold out. 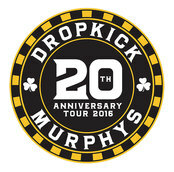 Tickets for the newly announced shows go on sale this Friday, December 11 at 10:00 AM ET at www.DropkickMurphys.com. Dropkick Murphys’ 20 Year Anniversary Tour kicks off February 17 at House Of Blues in Cleveland and wraps with the band’s traditional hometown run of Boston shows St. Patrick’s Day week (March 17-20, 2016). The trek also includes performances at many of America's most historic venues, including Chicago's Aragon Ballroom, the Civic Theatre in New Orleans, and two nights at New York City’s Webster Hall. Dropkick Murphys--Al Barr (lead vocals), Tim Brennan (guitars, accordion, whistles, vocals), Ken Casey (lead vocals, bass guitar), Jeff DaRosa (banjo, bouzouki, mandolin, harmonica, acoustic guitars, mandola, vocals), Matt Kelly (drums, vocals), James Lynch (guitar, vocals)--are touring in support of their latest release Signed And Sealed In Blood, which debuted in the Top 10 on the Billboard 200 and features “Rose Tattoo,” "The Boys Are Back," as well as “Out of Our Heads,” which served as the theme song for TNT’s police drama Boston’s Finest. Now celebrating their twentieth year, Dropkick Murphys remain bigger than ever, having sold over 6 million albums worldwide. The band continues to sell out venues around the world, including a concert at the historic Paris Zenith Arena in February 2015. In the summer months, the band remains a festival-topping act at all the premier European festivals. They’ve headlined Boston’s Fenway Park and been personally invited to share the stage with everyone from Foo Fighters to Mumford & Sons.